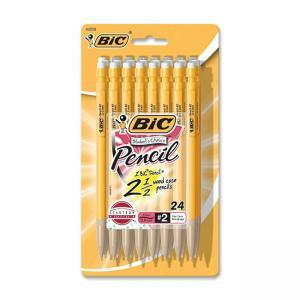 Mechanical pencils offer a yellow design that resembles the traditional yellow wood-case pencils and No. 2 lead that matches them. One mechanical pencil writes longer though and equals 2-1/2 wood-case pencils in writing length. 0.9mm point size delivers less lead breakage and bolder lines. Design also includes a top plunger to easily advance the lead.